Looking for a delicious one dish dinner? 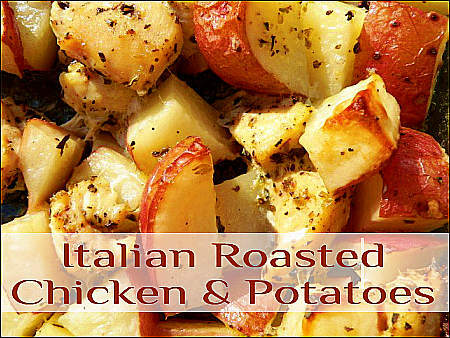 This simple chicken and potato dinner is full of Italian flavor. It reminds me of marinated grilled chicken with roasted potatoes but with a lot less fuss. Add a salad and you have a complete meal the whole family will love. Place chicken pieces in bottom of 9 X 13 pan. Place chopped potatoes on top of chicken. Drizzle heavily with olive oil and stir until all potatoes are coated in oil. Sprinkle remaining ingredients on top. Gently stir to evenly coat chicken and potatoes with seasoning. Roast 45 minutes or until chicken is done and potatoes begin to brown. What a fantastic dinner recipe! I love the spices you used in this dish and chicken and potatoes always go together perfectly. Thanks Tyna! I hope you enjoy it. So easy — will have to try. Bob would love this. Thanks Rogene! I hope Bob likes it. Made this for a family get together, and they were amazed that I was able to cook something so delicious (especially since I am new to cooking). This meal was packed with flavor, and everyone ate it all! I’m so happy you all enjoyed it. Thanks for leaving a comment! Have you ever made this ahead and baked it later? I’d like to take this to someone who has heart problems and I need something healthy and not full of cheese and fat. No, I haven’t. Do you think the potatoes would brown if they are coated in olive oil? If you try it, please let me know how it turns out. I think they would. I make oven roasted potatoes fairly often and always coat them in olive oil but I turn them a few times while they are in the oven. They are perfect and great with fresh parsley, some thyme, salt & pepper sprinkled on before baking — rosemary is also good but my plant didn’t survive the summer. My family is a picky group, do you think I could add sausage to the dish as well? I don’t see why not! Let me know how it turns out.